Please take another look and offer any comments on colour pics words etc cheers. I've seen in used in the sense of "At thesec prices, we're practically giving them away! ", but yes, it does have the possibiltiy of confusion. Here's a very rough idea of what it would look like with the skull and cross candy canes instead of the dog, and the chino image replaced with a back shot. Just messing around to see what it would look like with two wide leg shots, and a front and rear shot instead of two front on shots. Apologies if I'm stepping on toes editing artwork, no offence intended... just thought a visual example could make assessing possible designs easier. Here is the text. How does it read. What isn't working for you? What would you prefer to be mentioned? 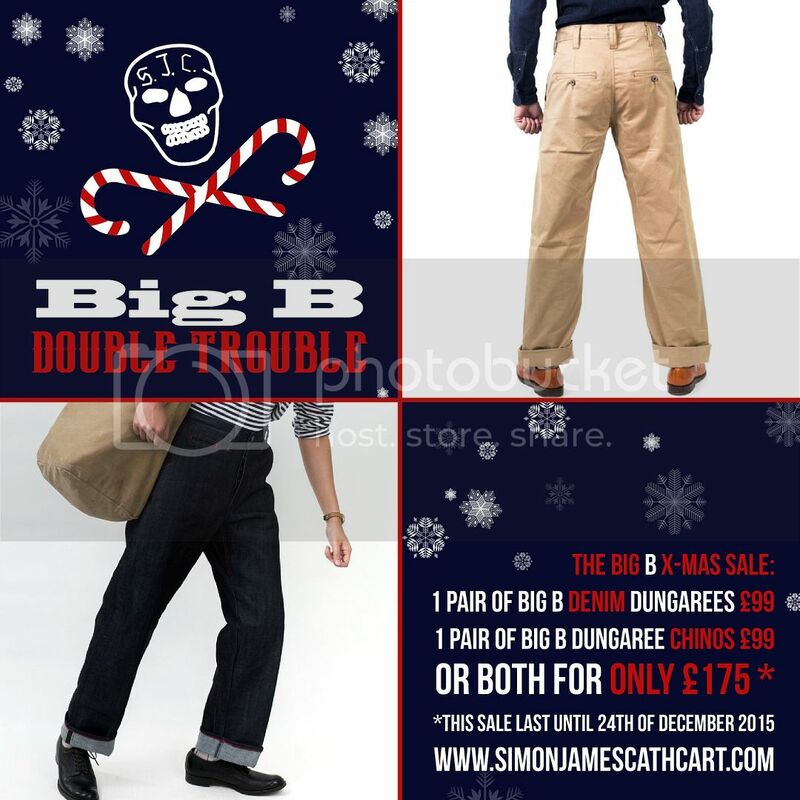 XMAS SJC Big B Dungaree Offer. Modelled on the wide leg 4 pocket dungaree of 1930's (plus coin pocket). These are not jeans but pants with a high rise, a full leg and move beautifully. Generously cut around the hips they capture the Dustbowl vibe and look great on both boys and girls. The Big B’s feature deep 12oz sailcloth pockets and are held together with the thick cotton, bartacks and feature subtle top stitching details. They are stylish enough to be worn in the office, out at night, but also hard wearing enough for any manual work. Available in denim or 12oz Chino. or our slubby 15oz Thai denim, identical to the Okinawa, but very soft. The denim has had a cold soak so minimal shrinkage, order your true size. SJC suggests that a wide leg should be worn uncuffed. But that is up to you. Either way measure a pair of jeans that fit very well from the crotch seam to the hem and add your cuff length if you want, we will chain stitch them for free to your length. And here it is: SJC is offering you two for the price of one, or just £99 each. So order a pair in Chino and Denim, or Chino and Chino (you always need a backup pair). Or Denim or Denim. Get both for yourself. Or one for you and one for your friend. Yes, we've thought of that too. Download the SJC Big B Xmas Card, print it on some heavy paper and give it to your friend this season telling them you've brought them something special. These will be made in Jan and shipped in Feb.
Looks good. Any danger of "boys and girls" being misread as "in kids' sizes", or am I over-thinking it? No offense taken, swinglish. Design away. I was just thinking: "No Logo?" but SJC is an extraordinary sales model and it will be promoted on the own page so I guess it's OK. The text with comments in red. Modelled on the wide leg 4 pocket dungaree of 1930's (plus coin pocket). These are not cut like ordinary jeans but pants with a high rise, a full leg and move beautifully. Generously cut around the hips they capture the Dustbowl vibe and look great on both boys and girls. Available in denim or 12oz Chino. or our slubby 15oz Thai denim, identical to the Okinawa (I wouldn't mention it. sounds like second choice really) , but very soft. The denim has had a cold soak so minimal shrinkage, order your true size. And here it is: SJC is offering you two for the price of one (name final price! too confusing otherwise), or just £99 each. So order a pair in Chino and Denim, or Chino and Chino (you always need a backup pair). Or Denim and Denim. Get both for yourself. Or one for you and one for your friend. Yes, we've thought of that too. Download the SJC Big B Xmas Card, print it on some heavy paper and give it to your friend this season telling them you've brought them something special. PS: Working on new versions of the Big B add this evening. This is fantastic Simon. Great idea. I might have to jump on a pair of the chinos. I've really been wanting those. Unkraut great job on the advert! This should really help us reel in some more folks. (12-07-2015, 05:25 PM)Edward Wrote: Looks good. Any danger of "boys and girls" being misread as "in kids' sizes", or am I over-thinking it? Maybe a little. Once they check the sizing chart it might clear it up. Maybe Guys and Dolls or something. I don't know if it's a big issue. Maybe it's best to not mention gender at all? Stick to mentioning a wide range of sizes and avoid any confusion with regard to specific male / female cuts? Please give me feedback on experience and glitches etc.